IRELAND INTERNATIONAL DENISE O’Sullivan was crowned a National Women’s Soccer League champion on Saturday night, as her side North Carolina Courage saw off Portland Thorns 3-0 to secure the title. The NWSL is the top-flight division in women’s football in the United States, with yesterday’s achievement becoming the third country that O’Sullivan has won a national league title in following previous success in both Ireland and Scotland. The 24-year-old Cork native joined the club in July 2017 following stays at Peamount United, Cork City and Glasgow City, moving to NC Courage following one season with Houstan Dash. The midfielder was named her club’s Most Valuable Player (MVP) earlier this week for her involvement in their successful title win, commanding her side in a holding midfield role. 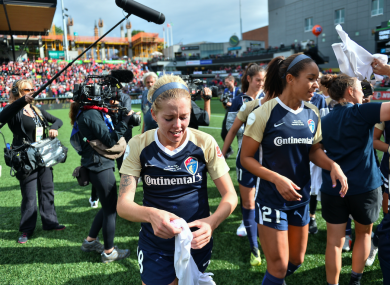 Goals from Brazil international Debinha and a double from Jessica McDonald in front of sold-out capacity crowd of 21,144 at Providence Park made it a comprehensive victory for NC Courage. It is the club’s third title this season after already claiming the Women’s International Champions Cup and the NWSL Shield earlier this year. Email “'Best day of my life' - US-based Ireland international O'Sullivan wins National Women's Soccer League title”. Feedback on “'Best day of my life' - US-based Ireland international O'Sullivan wins National Women's Soccer League title”.